Quite apart from the questions about use of light, pose, gesture, etc that copying answers more clearly than anything else, I also began to get a real sense of how fully realised this event has been through drawing -in the book or the gallery you just go 'oh yeah that's Judith, etc.' but folllowing through the decisions about profile, costume, etc on the page with my own marks made that dreadful but ludicrous strategy -how do you go about chopping off an enemy general's head in a seductive guise begin to resonate. 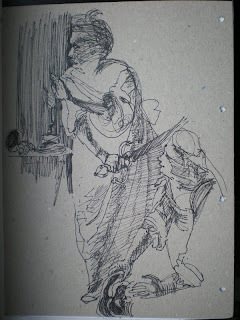 The tiger in the rainstorm drawing and mine of Judith also starting me thinking about the different qualities of fright and violence in each image through drawing. In the tiger image with the coloured pencils there is that sense of lashing and striping that seems to fit so well. I'm trying to put into words the feel of the Judith image -guilty silence, the pause between violent actions. Are the marks I've used correct for this feeling?